In Stephen King’s latest novel “Revival” we meet the narrator Jamie Morton telling the story from childhood to later on in life. As a young boy he meets Charles Jacobs, the new minister in town and becomes instantly fascinated by this man and the rest of his family. One of the things that make a strong bond between Jamie and Charles is the reverend’s obsession with electricity. Everyone likes the new minister, his work in the church and his family, but when a tragic accident occurs Charles curses God, mocks religious beliefs and is banished from the town. Years go by and Jamie grows up. In his mid-thirties, addicted to heroine and recently lost his latest job as a musician he meets Jacobs again. Jacobs helps him get back on his feet again and that time their bond turns into a pact forged in horror. What happens next, you will have to read to believe! What can I say? I finished this book last week and had such a book hangover that I did not feel ready to review it until now. 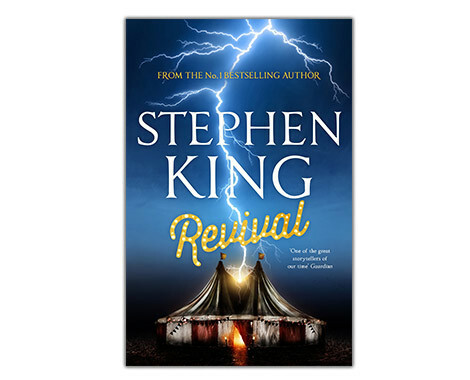 Revival is classic Stephen King and as a major Stephen King fan I absolutely loved that! You could easily see his inspirations throughout the book and a lot of the references to other authors work and his own had me giggling like a hopeless girl with a crush. I found it thrilling, exciting and out of the ordinary. Loved the characters and the way that Jamie is such a relatable character because of all his struggles. I read some reviews of this book before it arrived at my very own doorstep, and most of them talked about how the ending was so surprising. And I have to say (even having been warned) it was! When it comes to Stephen King you never really know what you’re going to get in the end and sometimes (like now) it leaves you with an amazingly huge book hangover to get over. Loved it! Love love loved it! Definitely one of my new favorites! Highly recommend it if you’re a fan of his earlier work (i.e. Salem’s lot, bag of bones). It’s scary and it’s awesome!